Kansas City Chiefs quarterback Patrick Mahomes II is off to a red-hot start after becoming a starter for the first time this season, while Trubisky has been inconsistent in his 13th and 14th career starts. Considering the two QBs operate in essentially the same offense for different teams, and Mahomes' success, the popular assumption is Bears general manager Ryan Pace may have wasted two third-round picks and fourth-rounder to move up to take Trubisky when they could have simply stayed put or moved down to get Mahomes or another passer in 2017. "I don't see it that way," said Bears coach Matt Nagy, who has coached both players. "I think a lot of outsiders will because it's easy to compare two people because they were drafted in the same draft, top 10, one ahead of the other. So those comparisons are easy." It's even easier to make the comparison when Trubisky has been in 14 games with a passer rating of 77.9 to go along with nine touchdown passes and nine interceptions, and Mahomes, in his three games, has 10 TD passes, one interception and a passer rating of 130.1. Mahomes had all 10 TD passes in the Chiefs' 2-0 start this season. "I don't think that's fair to Mitch to be put in that position, and so I know Mitch doesn't put that on himself," Nagy said. "We certainly don't do that. Hopefully in the end both of them have great, long careers in this type of offense." It's all in the system, according to Nagy. He believes the 2017 season Mahomes spent in Andy Reid's offense -- all but one of last year's games as a mere observer -- to be more valuable than the 12 games of starting experience Trubisky gained last year in a different offense. "You have one guy (Mahomes) that has had plenty of time now to learn it, and when I say plenty of time, trust me, he's learning this thing too," Nagy said. "So he's just had an extra year to go through it." Nagy coached Mahomes last year as the Chiefs offensive coordinator. 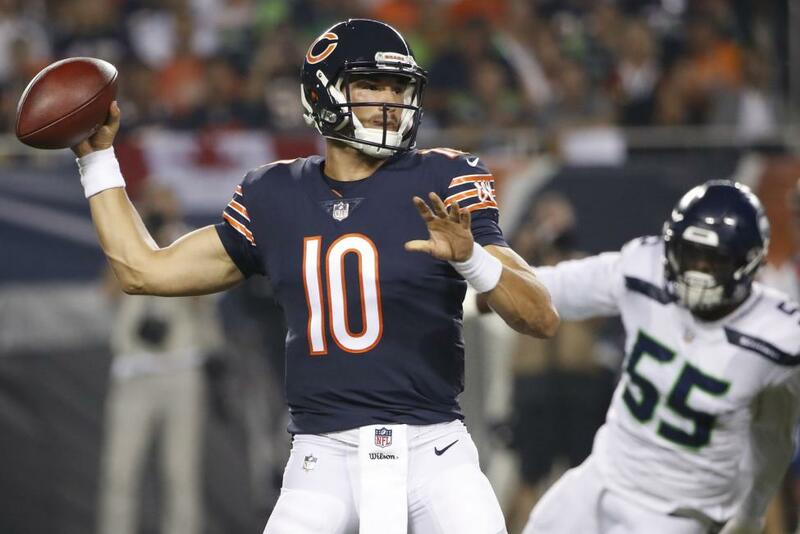 "Now, regardless of playing in it, he's had a full year, more than a year to sit behind it and learn and understand and watch tape with those quarterbacks last year and get to see all the talk, all the discussions of where you go on this play and that play, whereas Mitchell hasn't had that," Nagy said. "He's being forced into this thing right away, and so that's where these growing pains are going to occur." On Monday night, Trubisky showed improvement as a passer over his performance in the season-opening loss to Green Bay. In the 24-17 win over Seattle on Monday, he had an 83.0 passer rating, two TDs and two interceptions. He hit on 25 of 34 passes, but was especially effective when he needed to be in the second half. Trubisky connected on 12 of 14 after halftime. "I thought his footwork, his balance, his timing, his eyes were really good," Nagy said. "It can definitely improve but better from Week 1." It was far from perfect. After the Bears scored a touchdown on their first drive for the second straight game, the offense got bogged down with penalties and two Trubisky interceptions. "We had some bad penalties that made it first-and-15 and 20," Nagy said. "Plays where, you know, we have a 16-yard completion to Anthony Miller over the middle gets called back and we lose yards because we're not aligned the right way." Trubisky was also 6 for 7 on the game-opening TD drive. Being effective in the second half was even more important as the offense avoided going into a shell. "We just wanted to step on it, not being conservative whenever we got the ball back," Trubisky said after the game. "Just march it back down the field and score. And obviously we were in a different situation at the end, just trying to come out with a win. "But that's got to be the mindset of this offense all the time is just completions, get the ball out of my hand, take care of the O-line, get the ball to playmakers and let them do the work. It's still a learning and growing process." Nagy echoed the sentiment, noting that Trubisky did overthrow a wide-open Taylor Gabriel for a possible TD and had another bad overthrow intended for Jordan Howard. "There were a few plays in there where his eyes went different than where they should have gone, with the coaching staff -- not many, though," Nagy said. "So I think we're getting closer with it. "He understands that. We gotta just figure out what those plays are where, every time, his feet and his eyes are going to the exact same spot as our eyes are going. And he's making good decisions based off of the coverage." --The Bears' defense ranks first in the NFL in sacks (10) and is tied for first in causing fumbles (5). "That's just a glimpse, man," linebacker Danny Trevathan said. "We're just getting started." --RB Tarik Cohen (ankle) left Monday night's game in the second half and didn't return, but Nagy suggested it wasn't a serious injury. --DE Akiem Hicks left Monday night's game in the fourth quarter with an unspecified injury. He'd had some knee discomfort in preseason but the Bears said this was unrelated. --DB DeAndre Houston-Carson (forearm, back) missed Monday's game, the second straight he's been out. --RB Jordan Howard had only 14 carries a week after getting 15. Nagy said it's reasonable to expect more carries. "I think probably a few more carries is probably the answer to that, but we don't go into any game saying you've gotta get X amount of runs or X amount of passes," Nagy said. "We just kind of play it out as is."